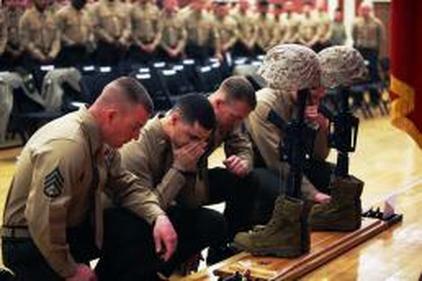 Four Marines with Combat Logistics Battalion 2, 2nd Marine Logistics Group pay their respects to two fallen comrades during a memorial service aboard Camp Lejeune, N.C., Feb. 22, 2103. Cpl. 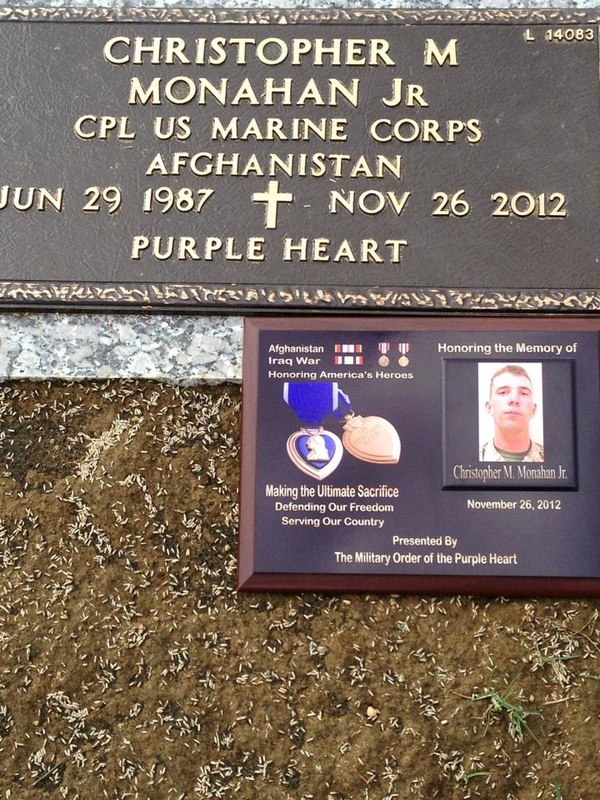 Christopher M. Monahan Jr. and Lance Cpl. Dale W. Means, motor transportation operators with the battalion, who were killed while providing tactical logistics support to units serving in Helmand province, Afghanistan, November 2012. 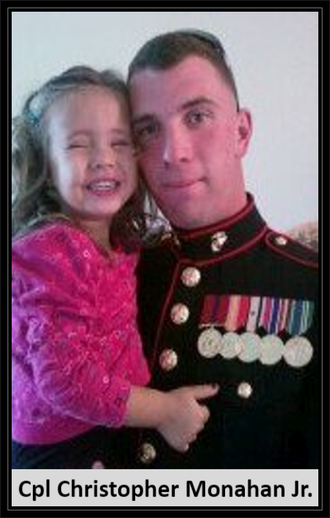 Died: November 26, 2012, Operation Enduring Freedom. Unit: Combat Logistics Battalion 2, Combat Logistics Regiment 2, 2nd Marine Logistics Group, II Marine Expeditionary Force, Camp Lejeune, N.C..
U.S. Marine Cpl. Christopher M. Monahan Jr., age 25 of Island Heights, died Monday, November 26, 2012 defending his country in Helmand province of Afghanistan.Born in Toms River, Chris spent most of his life in Ocean Gate, and most recently lived in Island Heights before his deployment. 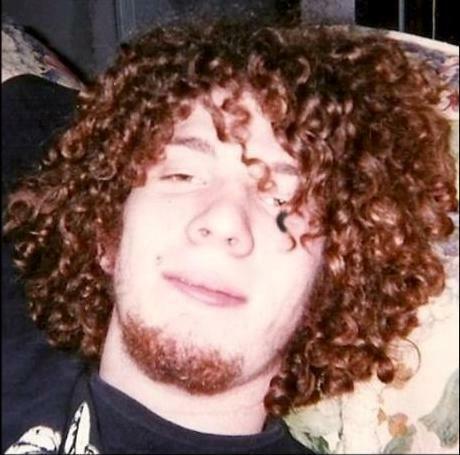 He was a 2006 graduate of Central Regional High School, Berkeley Twp. where he played football. After graduation, Chris joined the U.S. Marine Corps. This was his third deployment overseas, having been deployed twice to Iraq before his deployment to Afghanistan. 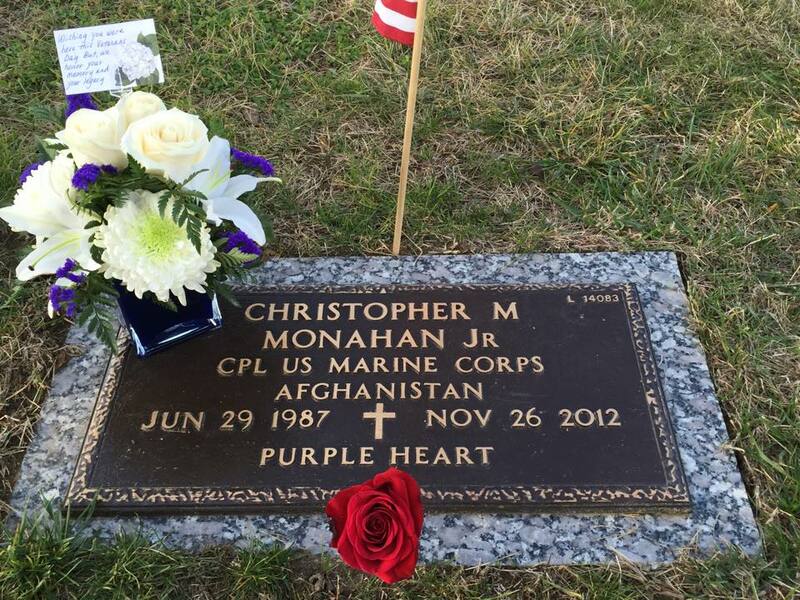 Chris was a motor vehicle operator assigned to Combat Logistics Battalion 2, Combat Logistics Regiment 2, 2nd Marine Logistics Group, II Marine Expeditionary Force, Camp Lejeune, N.C.
Chris was an amazing and loving father, son, brother, grandson and friend. Left behind are his wife Sarah, and his children Nathan, Kierlyn and Caleb; his parents Christopher M. Monahan, Sr. and Sandra Monahan; maternal grandparents Lenny and Linda Adams of Toms River and paternal grandmother Leah Monahan of Bayville; his great grandfather Alfred Larsen of Pelican Island; his brother Matt, sister Kaitlyn and his best friend and second brother Rob Zilavetz. Chris is also survived by many loving aunts, uncles, nieces, nephews and cousins. Visitation will be held Wednesday, December 5, from 2:00 – 9:00 p.m. at the Anderson & Campbell Funeral Home, 703 Main St. Toms River, NJ. A mass of Christian Burial to celebrate Chris’ life will be held, 11:00 a.m. Thursday, at St. Barnabas R.C. Church, 33 Woodland Ave. Bayville, NJ. Burial will follow at Brig. General William C. Doyle Veterans Memorial Cemetery, Wrightstown, NJ. OCEAN GATE — Marine Cpl. 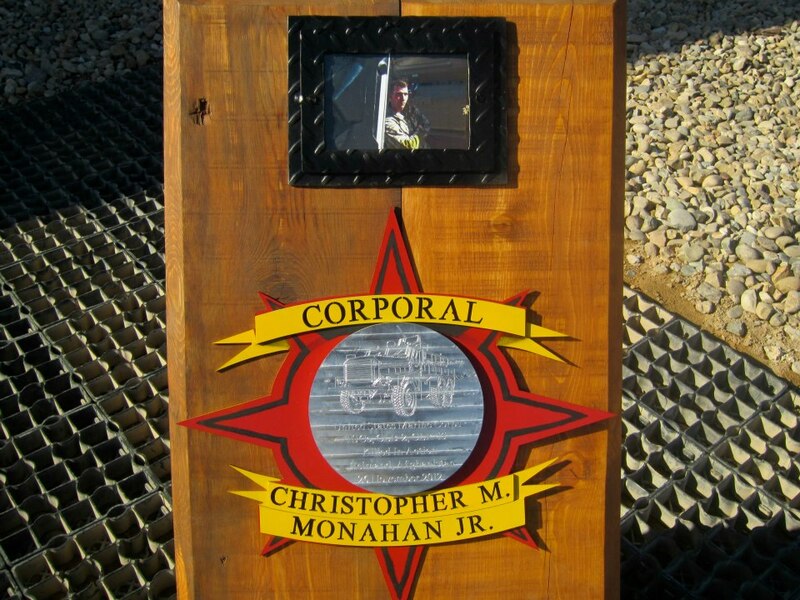 Christopher Monahan Jr. was the guy everybody looked up to. The oldest of three siblings, he was a guiding light for his mother and a role model for his three young children, family members said. "In school, his teachers just loved him," his mother, Sandy Monahan, said tonight. "He had no problems in classes. He played sports and volunteered for everything. He just did everything for everybody." 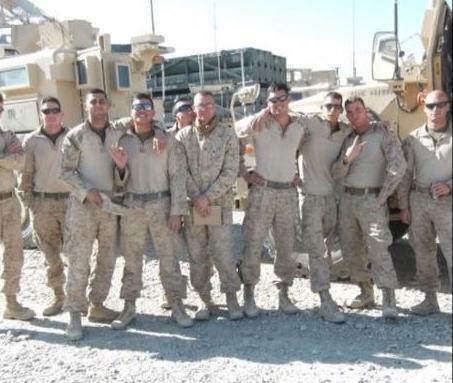 After graduating from Central Regional High School in Bayville in 2005, Monahan and a friend enlisted in the Marines. His father had served in the National Guard and Chris wanted to serve his country, too, his mother said. In fact, she said, Chris dreamed of making the military his career. That dream ended on Monday when Monahan, 25, of Ocean Gate, was killed in Afghanistan. According to the Department of Defense, the truck in which he was riding struck an improvised explosive device in Helmand Province. His mother said she was told her son was riding in the turret of the lead vehicle in a convoy of 27. Monahan is at least the 48th service member with ties to New Jersey to die in Afghanistan since the war began in 2001. In addition, 102 service members from New Jersey have died in Iraq since 2003. Sandy Monahan said she last spoke to her son on Saturday and, although he wouldn’t be able to come home for Christmas, his deployment would be ending in a little over two months. "He was definitely excited to be coming home. He had one more holiday to miss," his mother said. "He was going to be home in 73 days and had already started the countdown." Monahan was assigned to the Combat Logistics Battalion 2, 2nd Marine Logistics Group, II Marine Expeditionary Force based at Camp Lejeune, N.C., the Department of Defense said. The battalion is responsible for delivering fuel, ammunition and supplies to outlying patrol bases in Afghanistan via ground convoys and air. This was Monahan’s third deployment overseas, but his first to Afghanistan, his mother said. The previous two were to Iraq. "He just thought that what we were fighting for was definitely worth it and he wanted to do it," she said. 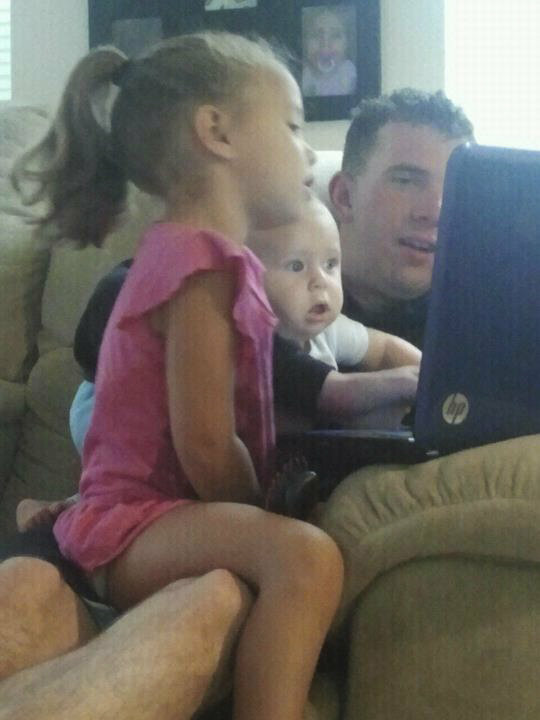 Monahan also wanted to be a role model for his three children, ages 6, 4 and 1, said his sister, Kaitlyn. "He said it all the time — the main reason he was doing it for his kids, so they had someone to look up to and be proud of," she said. Family members said Monahan played defensive back and wide receiver for the Central Regional football team. His sister said she and her friends went to all his games. Though small, her brother was fast, Kaitlyn Monahan said. "He was a skinny guy, and would just be gone," she said. Monahan also helped his younger brother get into football. "He was amazing," Kaitlyn Monahan said. "Everybody looked up to him, and he made everybody laugh even if he had a bad day." Sandy Monahan said she will travel today to Dover Air Force Base in Delaware, where her son’s body will arrive. Family and friends gathered at the Monahan home in Ocean County throughout the day yesterday to remember Chris. For his mother, the reminders of her oldest child were all around. "Everything I pick up, everybody’s eyes I look into, I see him," she said. "He is just everything, he is my heart." 1. The flag of the United States of America and the flag of New Jersey shall be flown at half-staff at all State departments, offices, agencies, and instrumentalities during appropriate hours on Thursday, December 6, 2012, in recognition and mourning of a brave and loyal American hero, United States Marine Corporal Christopher M. Monahan Jr.
of the Independence of the United States, the Two Hundred and Thirty-Seventh.